It is no longer grim up north - Leeds has been voted the UK's favourite city. The Yorkshire city left London trailing in the survey by the magazine Conde Nast Traveller. 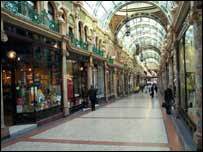 With its bustling nightlife, boutiques and hotels along with designer shops, Leeds is a hit with the 82,000 readers of the upmarket magazine. London came second in the magazine's annual readers' awards, followed by Edinburgh, which topped the poll last year. Glasgow and Bath made up the top five. The Lonely Planet guide recently dubbed Leeds the "Knightsbridge of the North". The judging criteria included architecture, culture, food and value for money. Liverpool got the highest marks for hospitality, Glasgow was voted the most user-friendly city and Bath was named the cleanest city in the UK. A delighted spokeswoman for Leeds City Council said: "This is another important step towards establishing Leeds as an internationally cosmopolitan tourism destination." The Ritz in London was voted the UK's best leisure hotel, followed by the Hotel Tresanton in St Mawes, Cornwall, and celebrity favourite Babington House in Frome, Somerset. Italy was readers' favourite country, the first time the award has gone to Europe. Rome was named favourite European city and the Cipriani in Venice was Europe's top foreign leisure hotel. The Maldives topped the list of favourite islands, and Bali came second - showing it is still popular with travellers despite last year's bombings. British Airways came first for business travel and international short-haul journeys, while Virgin Atlantic scored highest for long-haul trips. The awards were announced during a ceremony at the Science Museum in London.